On Tuesday, July 31, after numerous glasses of water, lots of wincing and many contractions it occurred to me that I may be going into labor. Which was ridiculous because I was at the Intercontinental Hotel, preparing for the next day’s meetings including a game-show parody, a slideshow of hundreds of employee photos and the CEO’s annual presentation on the company. Yeah, labor wasn’t on the agenda and after a few hours of non-stop contractions that were NOT going away, I decided to call it a day. Good thing too, cause I was in labor. After the examination at the Brigham, I was admitted and we were off to attempt a natural delivery after a previous c-section. Things were going all well and good until the epidural, which then slowed things down to a halt. After giving it our best, we had to go with a c-section and Isabelle Faith made her arrival at 7:36 am. She squawked angrily at being pried loose from her comfort zone, but to me it was pure joy to hear her fight for the first time. Like my other two girls, she has a full head of hair and a beautiful complexion. She was…pink. Pink! My heart baby was a beautiful shade of pink. I know that these babies start out looking like a normal baby, but after months of anticipating her illness, it was indescribable what I felt holding this beautiful, robust baby girl who was voicing her displeasure for relocating. I have thought about what to write in this post for two days. I thought that maybe I would write something about our first hurdle with the unpredictability of life with a CHD. Perhaps a nice paragraph about the joys of getting to know a breast pump while waiting for your milk to come in. Maybe some notes about how my immediately family can’t seem to maneuver a wheelchair without hitting an obstacle of some kind. How great it was to see family come to share our new little girl with us. One thing that happened today that I wanted to write about is how people who walk in similar shoes to yours are happy to come out of the woodwork to let you know that it will be ok. A fellow heart mom with whom I have had conversations with online, came in to see me today with her dad and her 2 year son with HLHS. She wanted to bring me hope along with some adorable clothes and support from her dad who also has walked a similar path to mine. I have never met these people but they went out of their way to give me hope today which I didn’t realize I desperately needed. Today as I walked the floor of the Women’s center, I realized that unlike the other new moms, my baby wasn’t with me. I felt singled out, different and ashamed. To me, it was a glaring reminder that we are DIFFERENT. I wanted to hide and run over to where Isabelle is but my body was giving out on me and I had to just stay still. I had numerous people tell me today that I need to take care of myself and recover, otherwise I will be in worse shape when she does have her surgery. So frustrating but tonight I didn’t have a choice. Chris sent me some gorgeous pics of the baby, which made me feel a little better. I know that this is the least of our problems, but it’s hard to be different when you really just want to be like everyone else. I hope I feel better about things tomorrow. 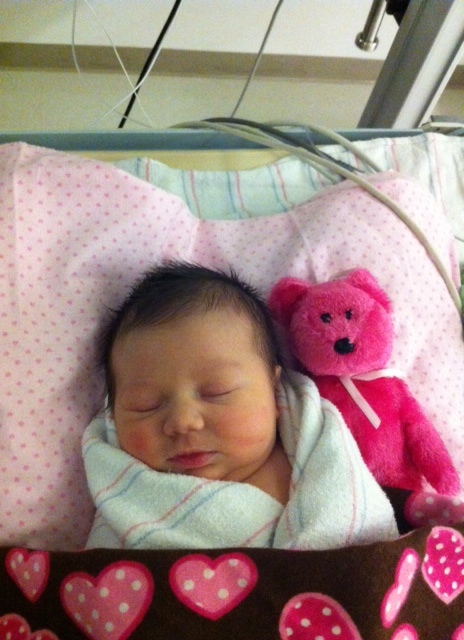 Isabelle’s first surgery is scheduled for Monday, Aug 6 at 7:30 am. The surgery can take up to 8 hours, and we have the weekend to snuggle with her. My plan is to hold her as much as possible, to breathe her in and tell her how much she is loved as I can. Different as this situation may be, I can still be her mom the best way I can be at this moment. The Day I was Quiet for Once.